My wife and I were watching HGTV's "Get It Sold" program and they showed this project. 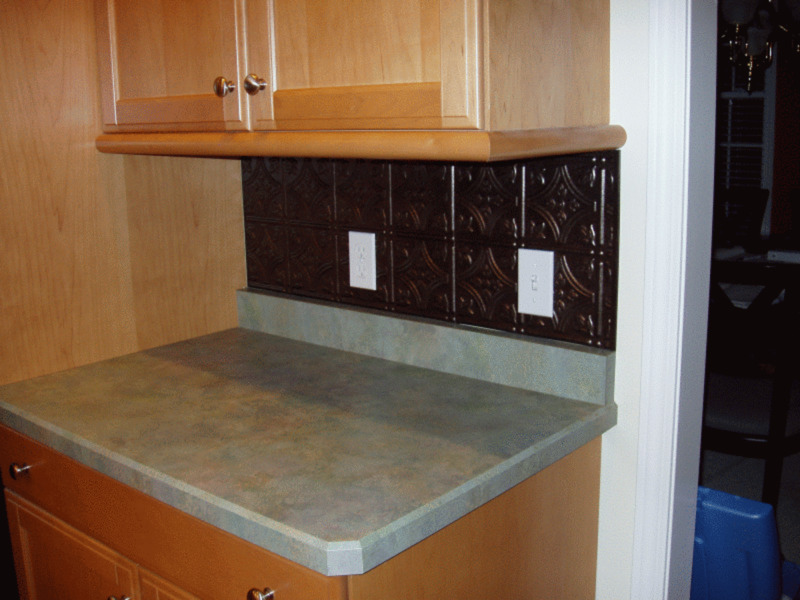 It uses backsplash panels available at your local home improvement store that provide an elegent solution for a kitchen backsplash. The official name for these panels are "Facade Decorative Thermoplasitc Panels - Backsplash" from ACP. 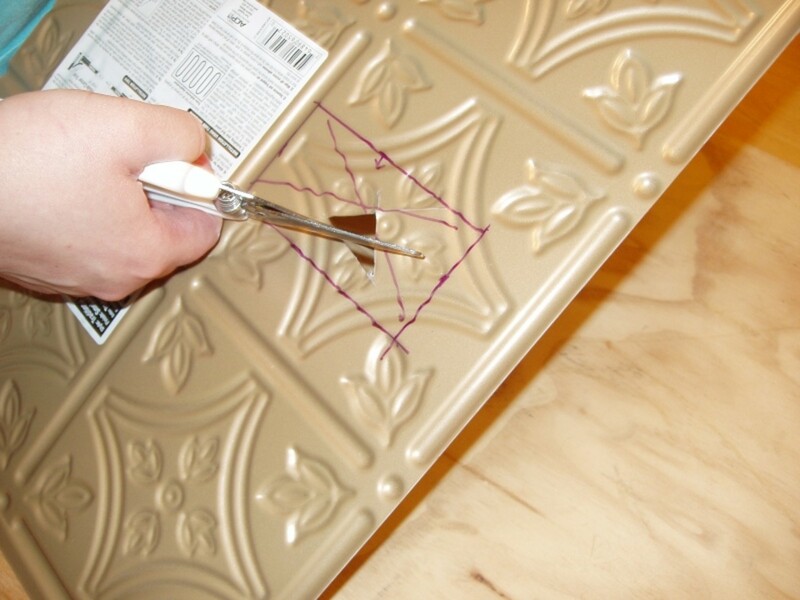 The give the look of a stamped tin panel with the easy clean up and installation of a plastic panel. The best part is that no special tools or skill are required. 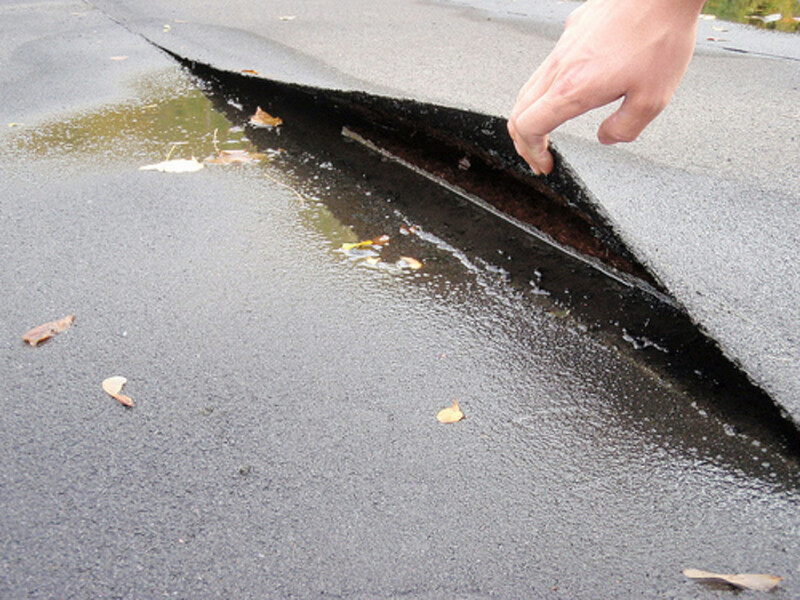 If you can use a utility knife, cut a straight line, and use a measuring tape you can do this yourself. We wanted to spruce up our kitchen but are planning to update our counters so did not want to do a large tile backsplash just to replace in a year or two. There are a dozen colors and several styles. We also noticed the different stores carried different colors and styles. We used the smoked Pweter panels which is special for Lowe's. 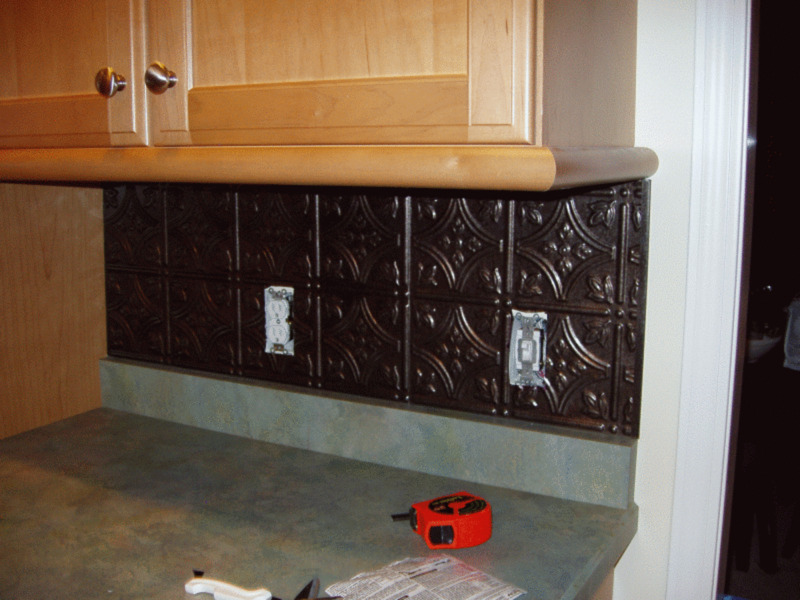 The project cost us about $300.00 for the panels, tape, trim pieces, and we splurged on new antique bronze outlet and light switch covers (these add up when you have 10 outlets / switches in your kitchen). We got it done over a weekend and a few weeknights, working on it a little at a time. I would guess you could do this in one day if you planned ahead. Thermoplastic Panels from ACP (available at Lowe's or Home Depot). 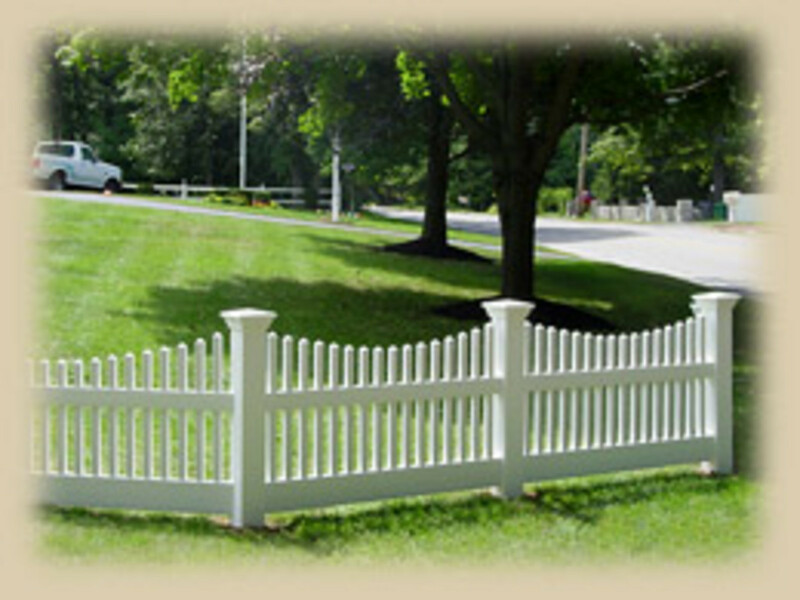 We use 12 panels (24" x 18") at ~$20.00 each plus trim. 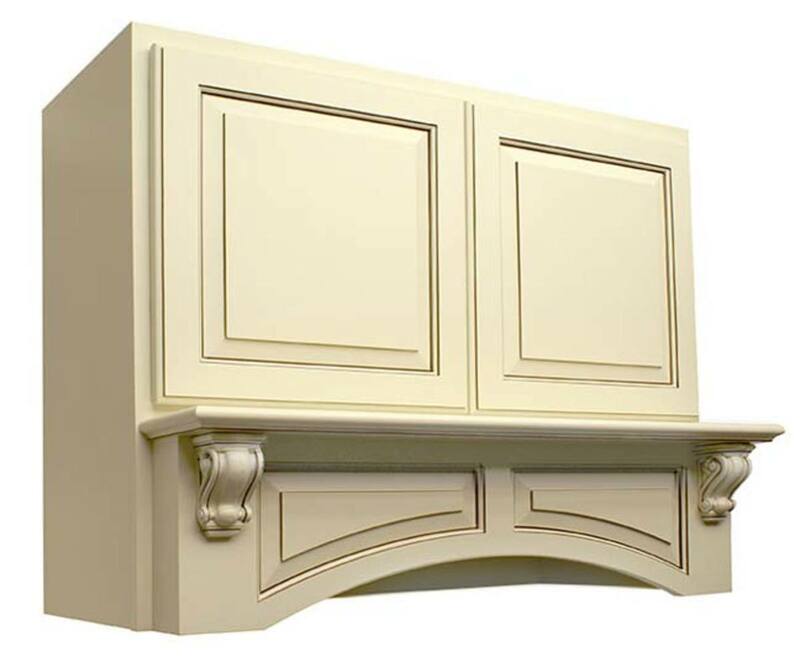 Matching trim pieces for the ends and any exposed top pieces (not under a counter). They have corner molding and end molding. Step 1 -Layout panels on counter and measure your cuts. Step 2 - Measure the cabinet height. 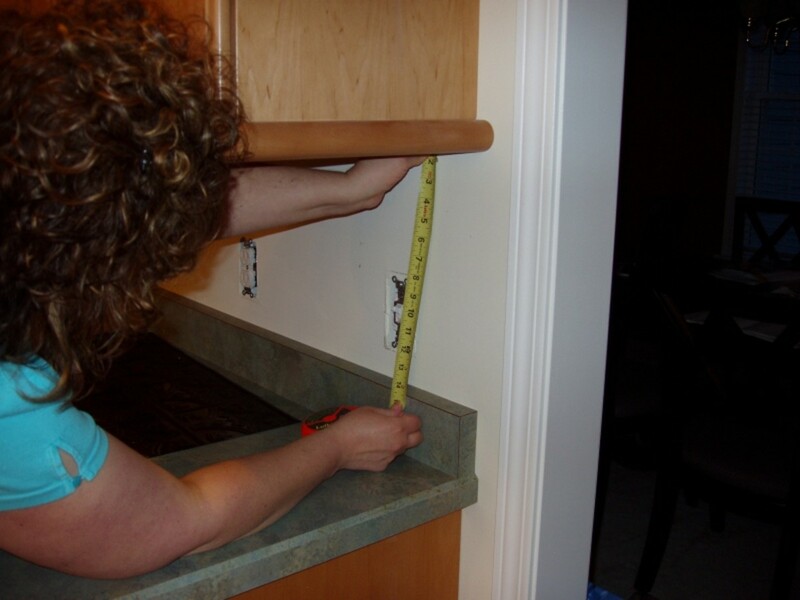 Step 4 - Measure outlet location from end of wall and from top of counter. 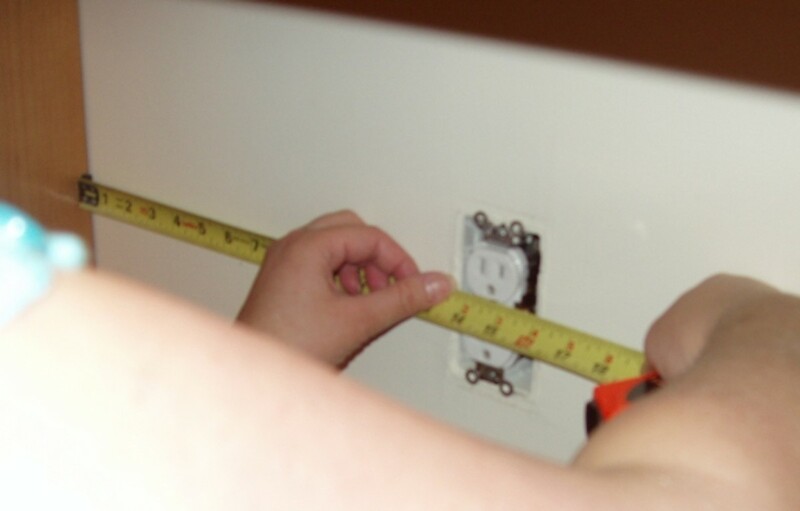 Transfer measurements for outlet to panel. Use straight edge to transfer to panel. Mark area to cut out with X. Step 5 - Use utility knife to cut a triangle out in center of outlet hole. 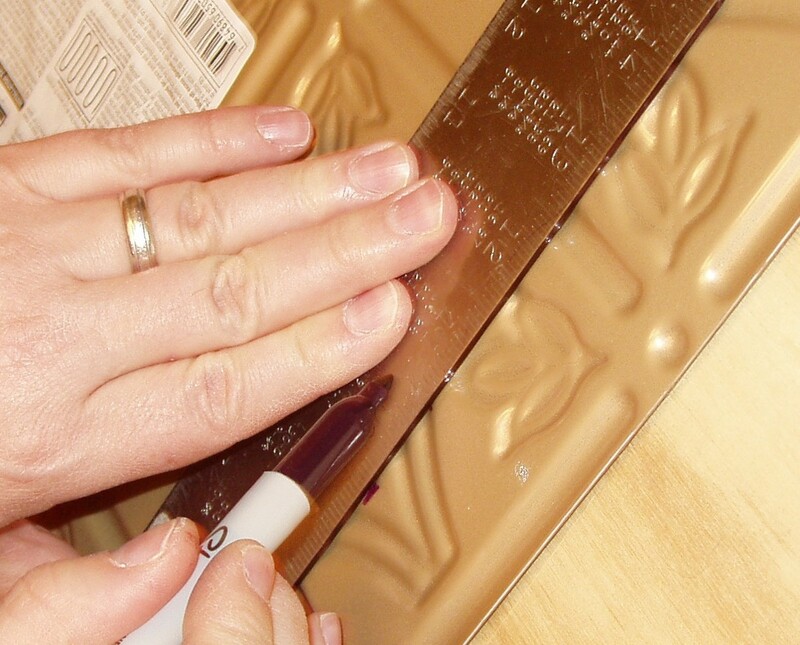 Use utility knife to cut to corners, then cut out perimeter of hole. Step 6 - Dry fit the panels to the wall. Some special trim cutting may be needed around the edge of cabinet. Step 7- Apply double stick tape to wall in three stips - Top, bottm and middle. Make sure walls are clean or tape will not stick. Step 8 - Carefully place panels on wall. Add an extra strip of tape where the two panels overlap. Re-install switch faceplates (may want to replace with a matching plate or use cover material). 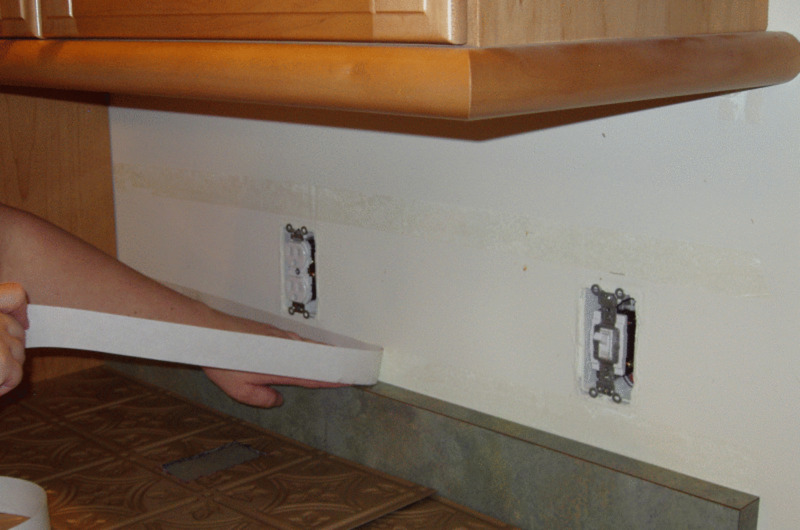 Note: You may have to add spacers on your outlets since the panels add depth to the wall. Repeat for the rest of your walls and you're done! 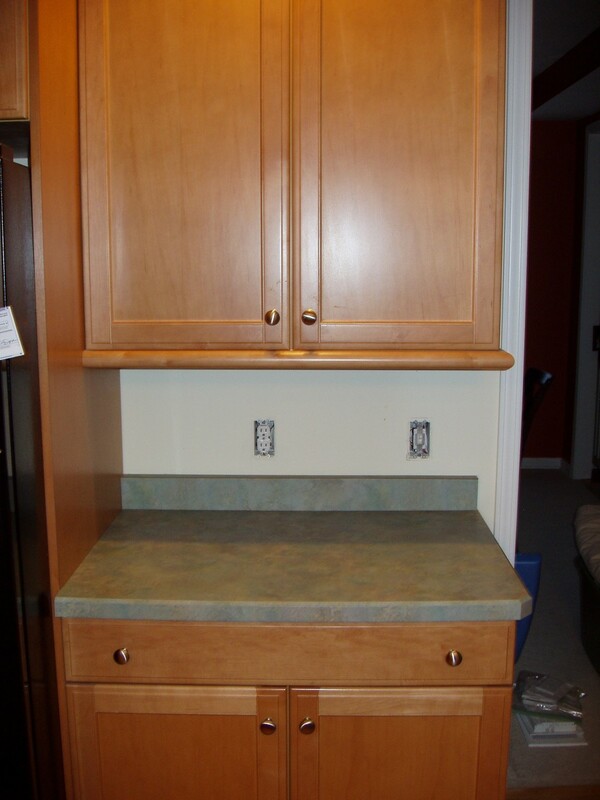 This project is a quick and easy way to give your kitchen a new look. The outlets are a pain. We tried several methods to cut these out and found the easiest is to follow the mfg directions to cut a small triangle out in the center of the hole, use shears to cut the X to each corner. We then scored the perimeter of the cutout with a utility knife and were able to snap the pieces off. Be careful since you can tear the plastic but it does make a clean cut. Around edges of cabinets we made small tweaks with shear to fit. Do it in steps so you don't cut too much off. Under the cabinet you can paint a black border. We tried using a sharpy and black tape. We decided unless you still you head under the cabinet you can't really see it so we ended up not doing this on the whole project. The tape is really sticky so be careful when setting the panels in place. Get the bottom edge right since this is what you will see. Also around the stove area make sure the walls are clean, any residue from cooking will cause the tape not to stick. Take your time and have fun. 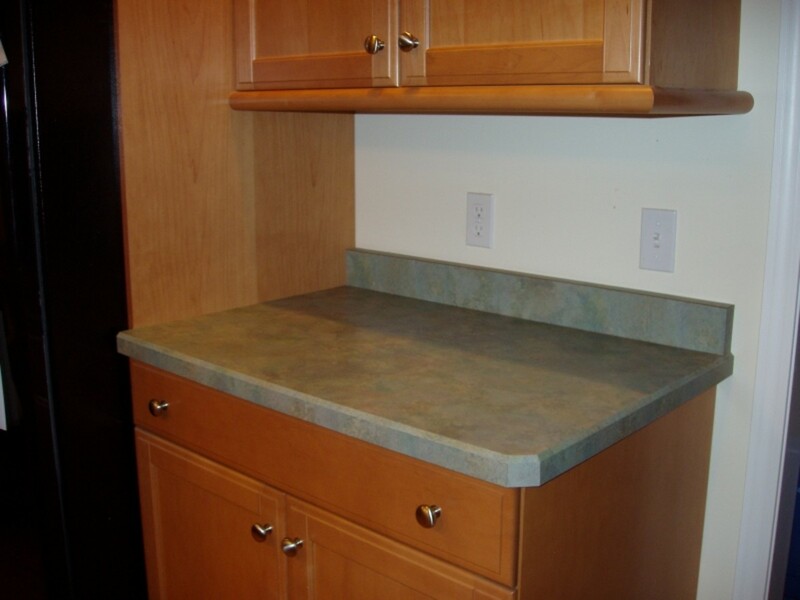 For a little effort and money this project makes a big change in the appearance of your kitchen. 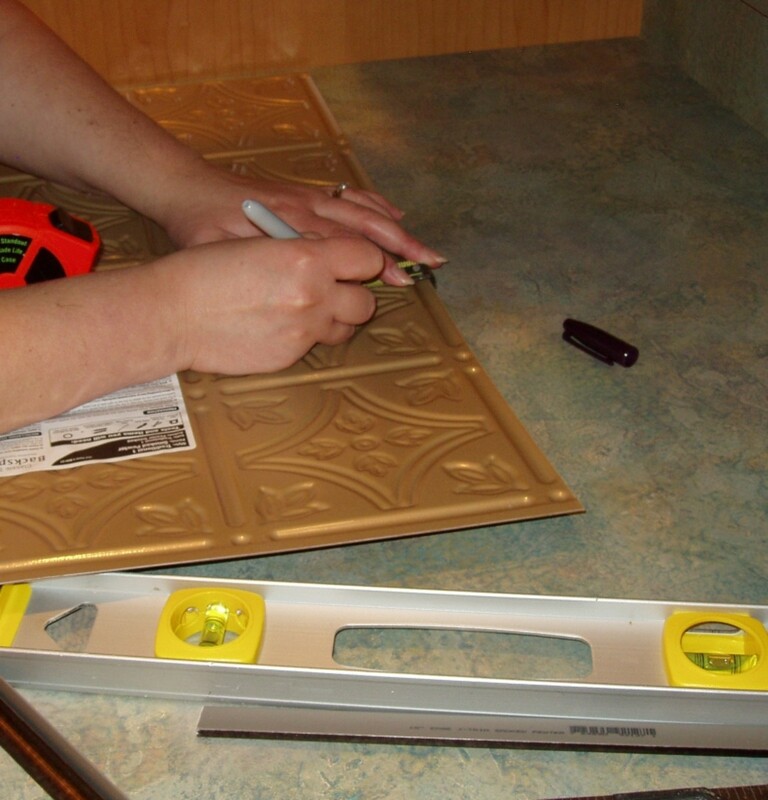 Step 1 -Layout panels on counter and measure your cuts. On this wall we only had two panel, and had to trim only the end. Step 5 - Transfer measurements to panel. Step 6b - The finished outlet markings on panel. Mark area to cut out with X. 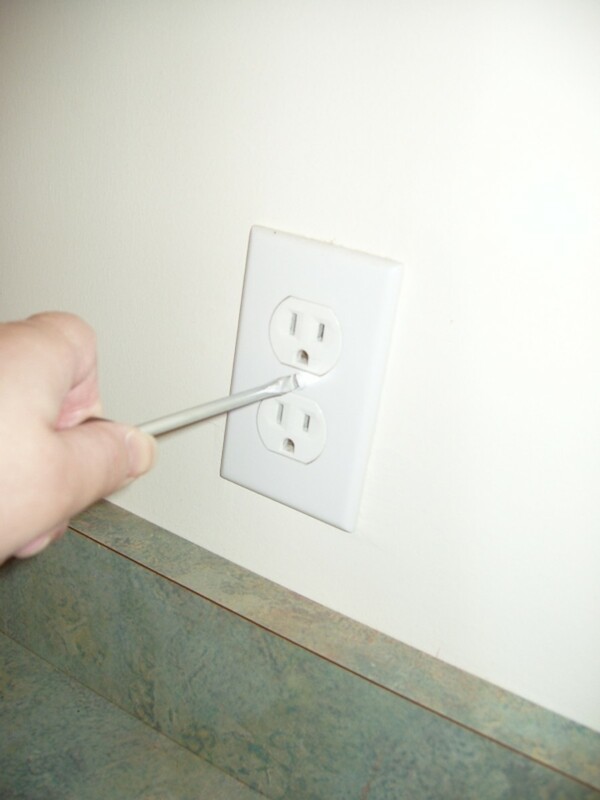 Step 7 - Use utility knife to cut a triangle out in center of outlet hole. Use utility knife to cut to corners, then cut out perimeter of hole. Step 8 - Dry fit the panels to the wall. 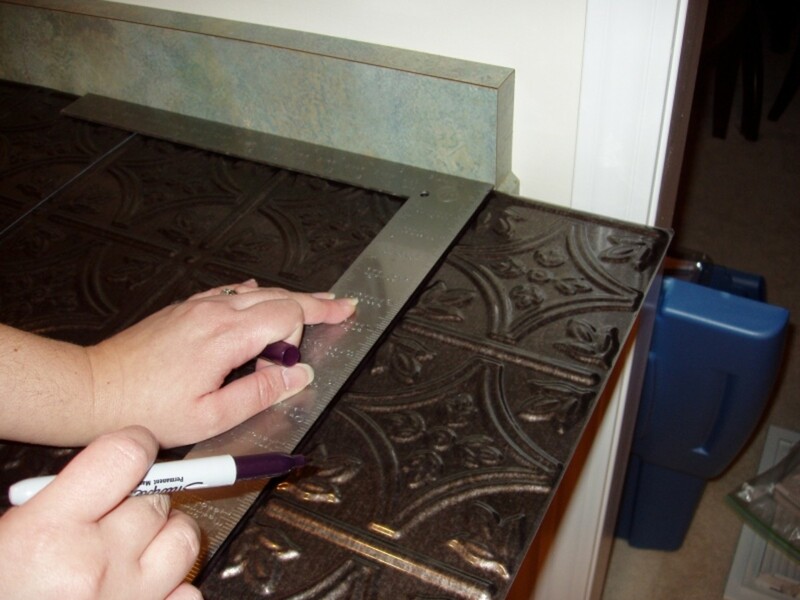 Some special trim cutting may be needed around the edge of cabinet. Step 9 - Apply double stick tape to wall in three stips - Top, bottm and middle. 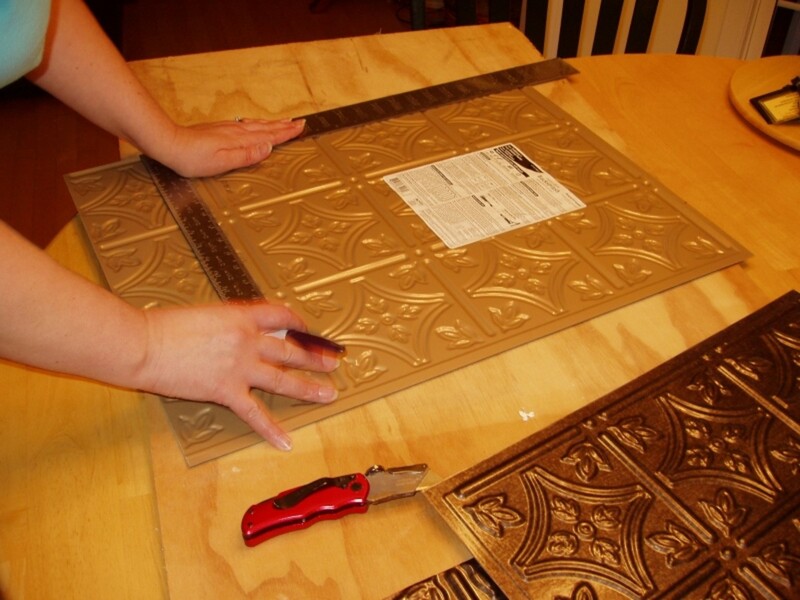 Step 10 - Carefully place panels on wall. Add an extra strip of tape where the two panels overlap. Re-install switch faceplates. 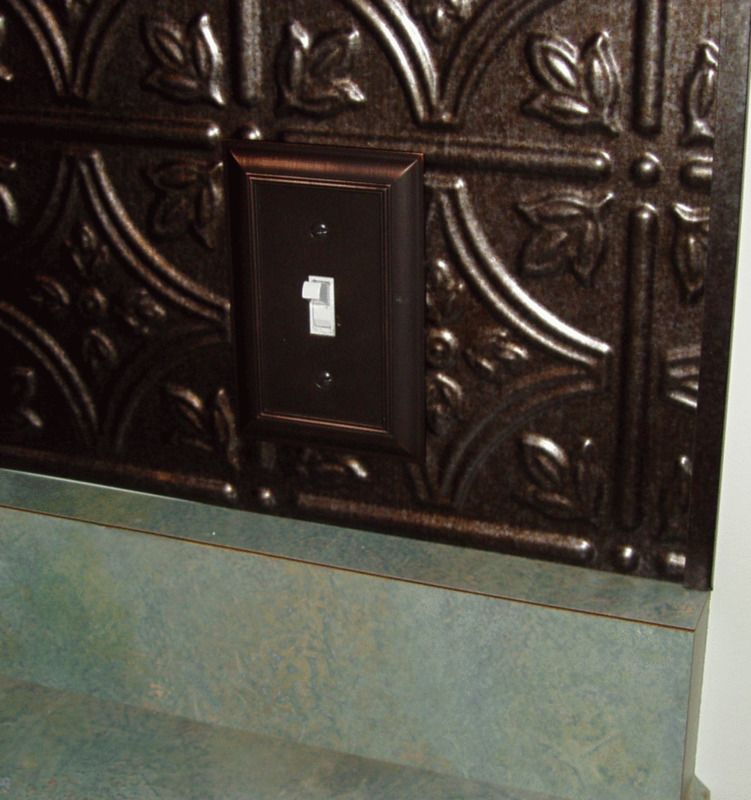 Note: You may have to add spacers on your outlets since the panels add depth to the wall. I had a question about abutting cut panels. I am putting it above a stove so I wanted a finished complete tile at both sides. I was worried about the adjoining cuts flushing up so I am thinking of overlapping the tiles since the recessed patterns interlock a little. Anyone do this also or any better advice? @Erin - We don't have pictures but we did have to go around a window sill. We basically fit it under the sill and use the trim piece to finish, then on the sides instead of trying to fit exactly to the contour of the trim, we over-sized the cut out around the window so it was a straight cut and then finished it with the trim. It looked very clean. We sold the house this was done on so I can't get better pictures. Scott- This is a little late but it should work over tile. 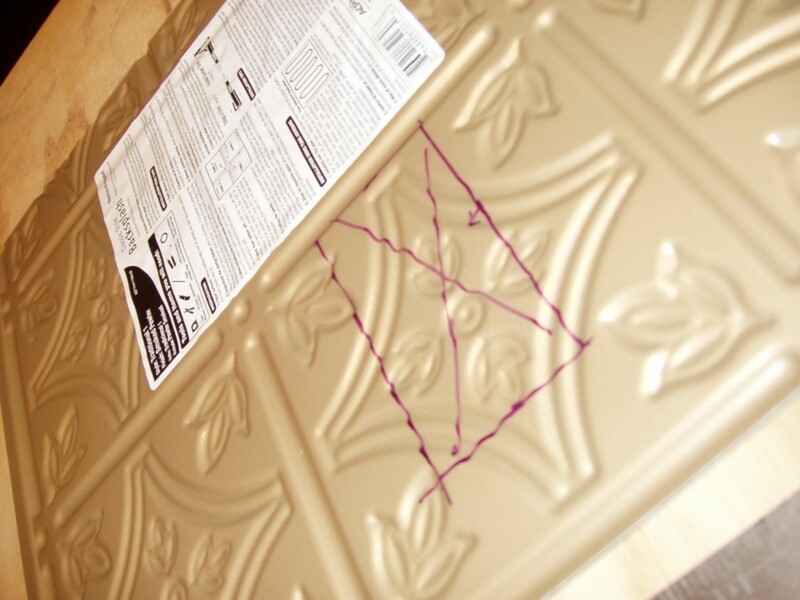 The adhesive or tape should stick fine, just make sure the tile is well cleaned. This is what I exactly looking. 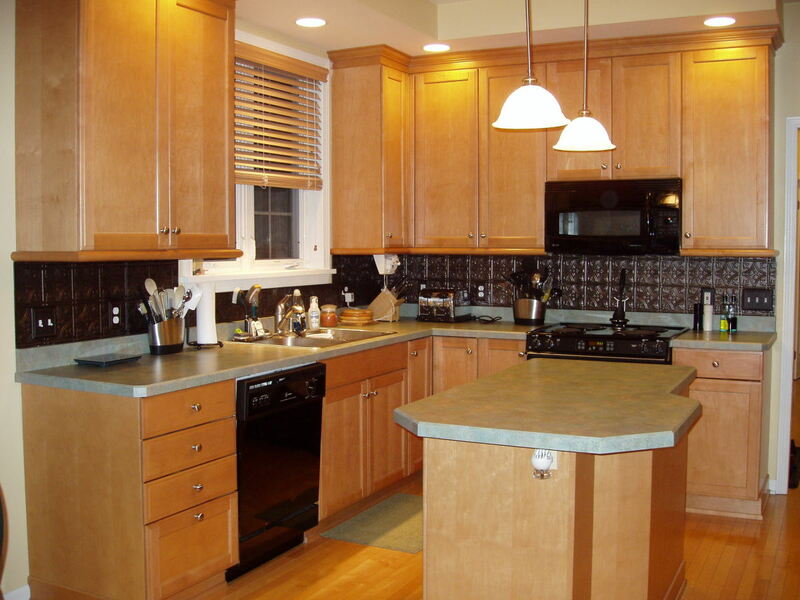 I am presently in the search of tips about it for my kitchen makeover and glad to see it here. Thanks. I really want to do this project but I am wondering how to cut the pieces to fit around the bottom of the windowsill...The lady at Home Depot suggested taking off the modling and putting it back, but 1) neither my husband or I are really keen on that and 2) it still leaves a small section around the attached sill that is curved and seems really hard to cut around...Any suggestions? I was wondering if anyone installed over existing ceramic Tile? would you have any tips. I see the applications going over bare walls. 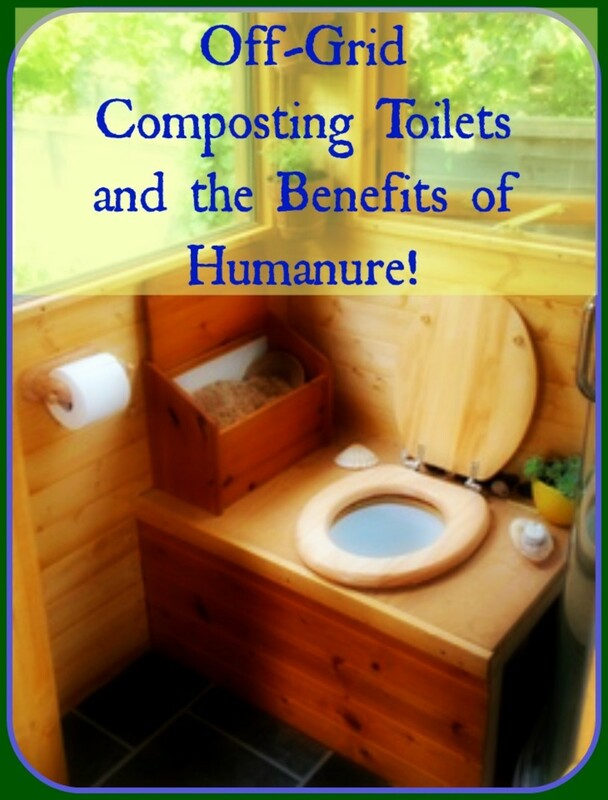 Very interesting!Love the idea.Thanks for sharing. Just installed the fasade ripple panels this past weekend and LOVE IT! It was very easy and really made our kitchen so mod! I would recommend this to anyone, and everyone! I just installed Facade panels this weekend. This webpage made things much easier. Thanks for the pictures, and it turned out perfectly. I didn't use the tape, however. I used PL Premium adhesive--it's the one recommended by APC. It worked just fine. Although I'm a hubber, I found this doing a search for fasade panel reviews. We're thinking about redoing our super outdated kitchen, but are on a serious budget. Your article is so helpful-thank you! @Kat - I believe it was the oil-rubbed bronze. Your post was great, although I was curious which finish/style of panels you used...I like the color, and I'm guessing it was maybe the oil-rubbed bronze or smoked pewter? I'd love to know so I can possibly order the same color. Thanks! Amazing step by step tutorial, thanks a lot for this one, because you saved me whole day. No issues with heat. Its been over a year with no issues. We have it right behind our stove. Can someone tell me how this does with heat? I know the website says 2-3 inches from heat and that makes me a little nervous but I love the way this looks! Thank you for the tips and pictures! I will be installing this week. I will let you know how it goes. I used these above my shower as a "backsplash", from the top of the shower enclosure to the ceiling. No more paint issues! 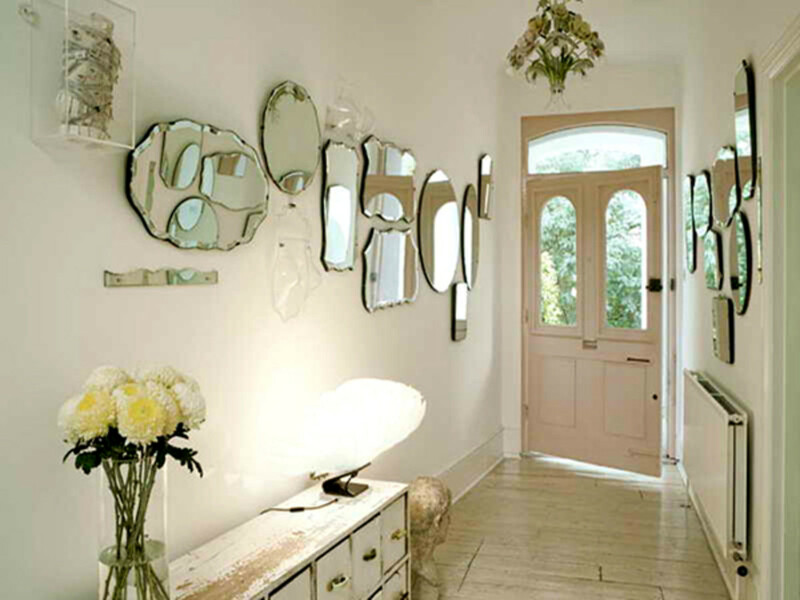 You have some great ideas for dressing up a kitchen. I love the tin panel wall cover. Nice hub. Very easy. Just wipe it down with mild cleaner. Nothing really sticks to it. Just wondering how easy it is to keep clean? @Amanda - How did your project turn out? I am just starting my facade backsplash thanks so much the instuctions should make my project easier. I will let you know how it goes. Soounds like an easy project. The instructions were easy and the pictures helpful. I think that even I could do that.